Welcome to my brand new blog feature! I'm looking forward to sharing a vintage item with you every day. Many of these will be from my shop, Birdhouse Books, but some may be from my own home, friends' collections, etc. I am happy to be surrounded by friends and family who love all things vintage! My first Daily Vintage offering is this cute vintage birthday card. 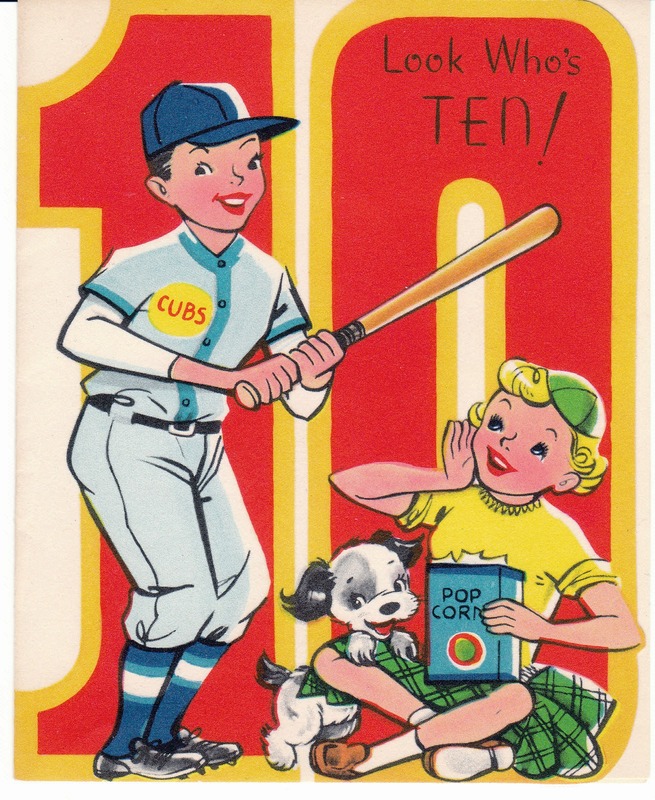 It features a little boy in a Cubs baseball uniform celebrating his 10th birthday. A little girl in a beanie cap is eating popcorn and cheering him on, and her terrier dog joins in the fun. Super cute! From Birdhouse Books: Baseball Boy Birthday Card. Thanks! I thought of you when I saw the baseball theme.